The solutions is available on pay-as-you-go or prepaid pricing. On-premise solution that helps manage cross-platform mobile and web application development, integrated frameworks, tools and more. Build a fully agile platform with automatic services. Pros: With this framework it simplifies and improves the use of the codes to be able to have an application structure with automatic answers, it is really useful and easy to learn. Cons: It only works with data base like mongoDB and some route management is complicated but it has complements and methods that solves everything. Overall: With it I can finish my projects almost instantaneously and with the best possible code structures and identacion. Powerful and effective framework to comprate with the best development. Pros: With this powerful framework I save a lot the development of codes making my web app as efficient and robust to the needs of adapting to today's technologies. Cons: It is not very stable, it always has a change or update in which it forces you to learn new things, but I do not complain about this great tool. Overall: with it I have created lots of web app that covers most of the needs of my projects. Pros: I love this framework because it gives me the opportunity to summarize my code and devise it in a better way, and best of all, it's free. Cons: Only works with a database and I would like you to have more options and labels for the best coding, you have to use base codes to make some things work. Overall: The truth can develop very fast since this framework was made to help you in the development. Cons: Meteor is a little slow when talking about catching up with the latest updates. Also when we have npm why use another package management, atmosphere, which is not maintained actively. Pros: Framework fullstack with many plugin for development quickly, very good management of resources and extremely efficient communication and use of mongodb. Use of publish and subscribe is very good to management roles, access and security. Cons: Impossible of generate render from server side, this make extremely inefficient and hard the indexing with Google (If use blaze). Icons and controls are limited. Meteor provides an encoding very indented and easy to read. Pros: helps and provides a better way of integrating data base in MongoDB making the applications as effective as possible besides summarizing a lot of code, excellent Framework. Cons: It only supports MongoDB as the main database and limits some linguistic integrations for the development of code. Overall: I can say that the use of this framework has adapted me to the needs of the market in terms of the demand for the development of new APP. 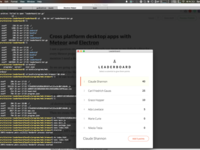 Overall: Has been an entirely new experience, React is totally a new way on programming, I start to like it and all wrapped in Meteor is just fantastic, the ability of to apps web in real time and mobile right away out the box couldn't be better. Recommendations to other buyers: You have to give it a try, 10min and see what is this about, it can has a lot of uses. Pros: There are a lot of packages available to do anything you want basically. Entire stack is based on JS so you only need single language knowledge. Love the React officall support. Cons: I would consider meteor for a prototype but for producttion site it doesn't make me feel comfrable since most of the community moved over to different frameworks. Cons: The first time it can be a bit difficult if you are not familiar with the command lines, however once you have mastered it you can streamline work with that framework. The app has a big Framework that can reused to develop your app. Deployment is a breeze. Just do Meteor and thats it. Cons: Documentation is very dated. It crashes constantly when launched in Windows 7/10. A lot of undocumented issues and redundancy with NPM. Overall: We are deploying a Medical App using Meteor. This lets us secure more resources and focus on new ideas instead of having to learn a lot of technical stuff. Everything is seamless and the overall experience has been very good. We don't need more than 1 person in charge of Sysops. Comments: MeteorJS is definitely a new cool framework that I would describe as evolutionary. The way you write server-side and client-side code and it's served up together is really interesting. But there are definitely some weird confusing things about it. For example, all your CSS and js dependencies, the only way you can control the order they are loaded is by alphabetical file naming.... that is really weird. There doesn't seem to be a place that you can simply define the load order other than how the files are named. Really really weird. The framework is pretty cool, but one of the main downsides to such a unique framework like this is if you build a project using MeteorJS and one day you decide to switch your project to use a different type of framework, you might as well re-write the entire thing since so much custom Meteor-specific code get's written in the meantime for your app. 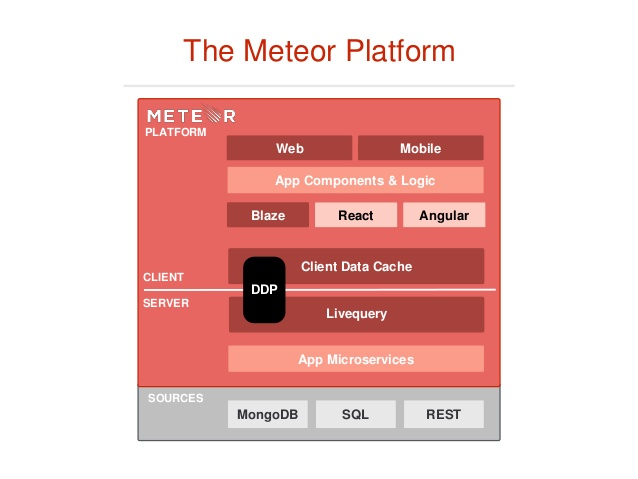 Pros: Meteor abstracts away a lot about the stack such that you don't need to worry about building a lot from the ground up if you are able to build the particular type of application that meteor is good at building (single page "live" apps). Cons: This is getting better with every release but, Meteor traditionally uses the global namespace too much making weird things happen everywhere if you aren't used to not having to import everything at the top of the page the way most modern JS dev works nowadays. Pros: first, this framework helps simplify the use of codes which makes app creation easy, efficient and robust. and also very great design features and functions. Cons: well, It only supports MongoDB as the main database on the framework, others should be integrated. Overall: quick and easy accomplishment of projects. Pros: One the big selling points when it was released is that you have a collection of packages to get started working on your project right away. Cons: Maybe one of the things I don't like about this framework is that is not very maintained and there is a lack of packages we can use. Pros: A good web framework, quite powerful, I have been able to do some applications and it has saved me a lot of time. Cons: They release updates very often and it's a bit difficult to understand if you do not have the necessary programming skills. 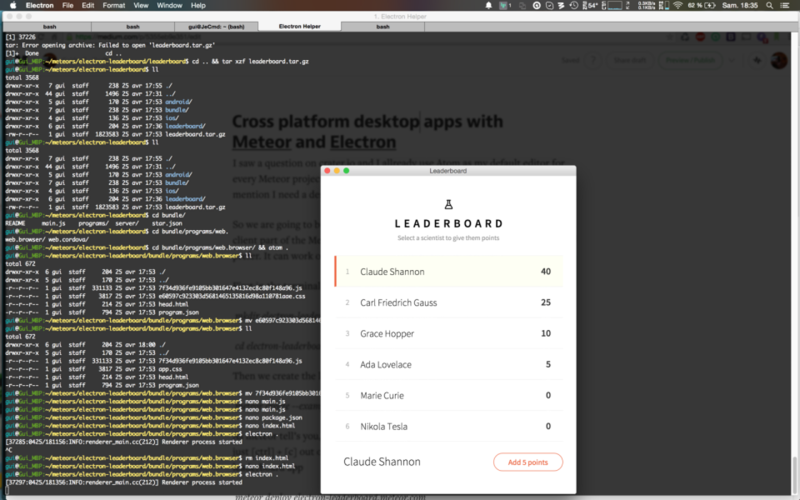 Overall: With meteor I write less and develop more. Overall: Really amazing framework that lets you get up a prototype very quickly. There's also a very active community forum and Galaxy hosting for apps made with Meteor. 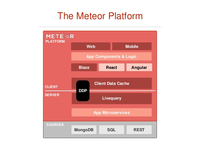 I was deciding between the use of Meteor and Firebase for a client. I had no previously experience. Cons: Supports only MongoDB, does not support vuejs yet (officially), documentation and real life examples could be updated a bit. Overall: Meteor helped us create a prototype of the product we wanted to create, at a short time scale. We just wish it would have supported mysql DB, and vuejs for the font.